This is the third part in the PowerShell Active directory series,in this part we are going to do the rest of the work to completely configure a User. As I did switch back on all my work PC's (I did call all my colleagues not to upgrade as all our AD tools are messed up, I will not update them, as I would not recommend to upgrade to RC2 of you work with AD a lot. We did create a bounce of users last time, but as I did say in last post we are not really ready yet with the users created, as we want also to fill in some more properties and enable them, you can take a user created in last post or as here start with a Fresh one. (note this first part does not work for ADAM users they need to use the Native Methods here, more info later in this post.). Note that we do not have to call Commit Changes here, this will be done automatically the .NET DirectoryEntry wrapper-object will handle this. Now you can see that, even when the property was not there before, It just got created and The Object saved again. exist. (Exception from HRESULT: 0x8007200A)"
This also works in an Active Directory environment ofcourse and as we shall see later in this post, there are also uses for those InvokeGet and InvokeSet methods in Active Directory use. Also when we Enable the account and set terminal serversettings, but first lets find out what properties are available.As we are busy with a User let's find out what properties are available. We will look this up in the Active Directory Schema.For this we need another .NET class, now from the System.DirectoryServices.ActiveDirectory NameSpace the ActiveDirectorySchema Class, and as a lot of the classes in the ActiveDirectory Namespace do, it does not have a constructor (see outputbelow), we have to use a static method . # ask what it can do for us . # Fill some properties in the Management Console. ADS_USER_FLAG_ENUM on MSDN. You can see From that MSDN entry that it is the 2nd Bit that controls "account disabled" True or False.Lets see how we can change that from PowerShell. 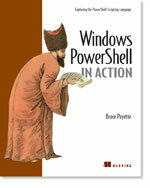 # Or let PowerShell do the counting. # while setting you will not notice that as this gets wrapped. Cannot convert "System.DirectoryServices.PropertyValueCollection" to "System.Int32". the reason behind the extra  will workuserAccountControl is a PropertyValueCollection, you need to set the item. For a list of those ADSI properties and methods see :IADsUser on MSDN. We did see in this post how to fill different User Properties and how to enable the Account . And that most properties you can easy set either on the DirectoryEntry or using the Native Com Object,but there are some properties that are stored in a special object therefor the Shortcut Methods in the Com object are more handy (UserAccountControl) or Needed (TerminalService Configuration). Also in ADAM native invokes are more needed.Also if you Come from VbScript and already know the native Method this could be handy, but for the rest is nice to use the wrapped properties as we not need to worry about arrays that much, and can do some exploring in PowerShell.OK, for the first time we needed to do some documentation Lookups, for the invokes but still not that bad I think. and we have all we need for creating the user now, you might want to set some more properties like DisplayName,GivenName,SN,Description etc also but they should be easy to find and set now, in the next post I will do a roundup in some functions, and take a look at CSV import possibilities and then go on to the DirectorySearcher Object. I know this has grown to a big post and there are some things a bit less intuitive as we would want, but thats also the case with other languages and scripting against Active Directory, this are not standard LDAP things and are about how its stored in AD, but we are a bit spoiled with the discover ability of PowerShell already ;-)I will provide more background links later, but I hope this post did clear some things up that seem a bit difficault at first but that they are not that bad, as I did see more examples and questions coming of people using PowerShell with AD in the Comments, the NG and other blogs (Also more about PowerShell in Common for example Scott Hanselmann did post a couple of cool PowerShell usages for links see : http://del.icio.us/powershell and you will see that the PowerShell fueled fire is burning harder and harder ) . In next post I will make an example combining the Creating and configuring of a User in a Script that is using CSV files to create users. (and the Example how I did create the Users form the AdventureWorks SQL example DBase I created on my Demo DC.I promised Jeffrey Snover ;-) ). And go on to the the Searching of Objects in AD. PSMDTAG:FAQ: How do I manage Active Directory? PSMDTAG:FAQ: How do I manage ADAM? PSMDTAG:FAQ: How do I add a user?